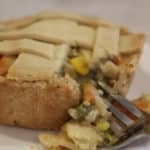 Gluten Free Chicken Pot Pie Recipe - Delicious GF Crust Recipe too! 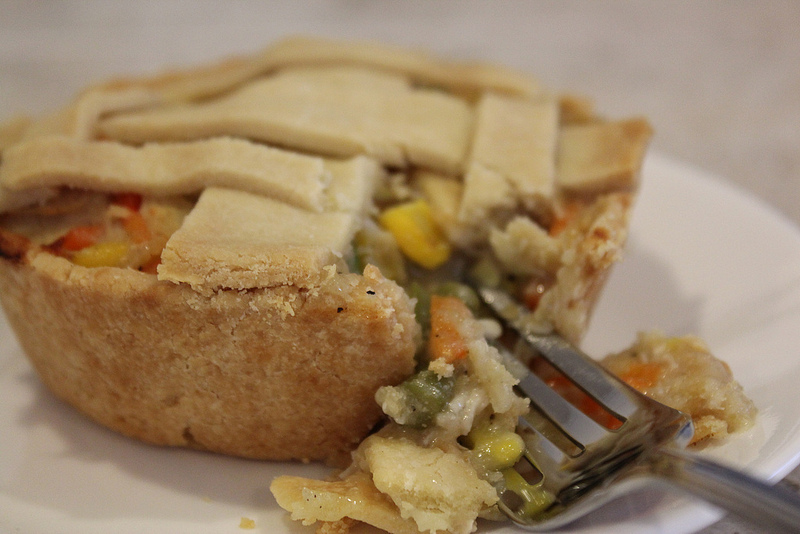 Chicken Pot Pie has always been a comfort food for me. 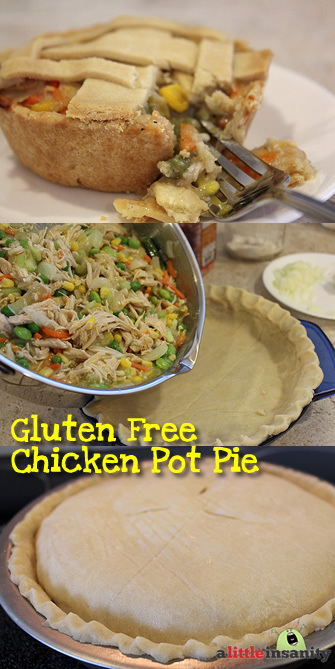 So one day when the kids were all sick at, I put together this Gluten Free Chicken Pot Pie Recipe for them. It immediately became a family favorite & now we enjoy it all the time… not just when we’re sick. The Crust is light & flakey, and the Filling is delicious – you won’t even know it’s Gluten Free! You can prepare this Pot Pie with just about any meat, or none at all. And the veggies can range from frozen to whatever’s fresh at your farmers market! Best of all, I make it with my Gluten Free Pie Crust so all of us can eat together. It freezes fantastically & can be prepared in bulk so you can have it ready for dinner in a pinch! 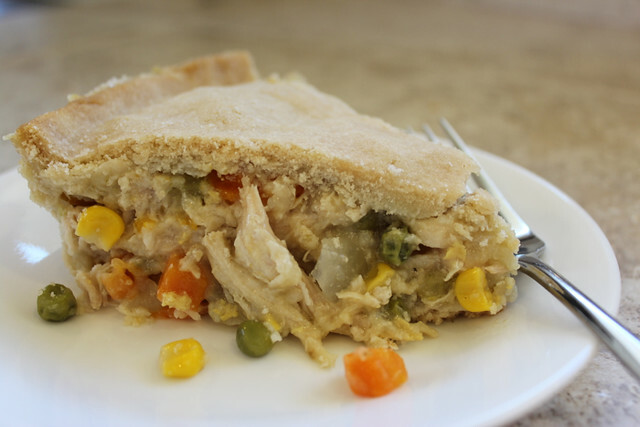 This Gluten Free Chicken Pot Pie Recipe is light & flakey and delicious! You can scale this recipe for bulk preparation. 2 Fresh or Frozen Boneless Chicken Breasts or Thighs (Boiled & Cubed or Shredded) – Feel free to use your favorite meat, or make it Vegetarian! 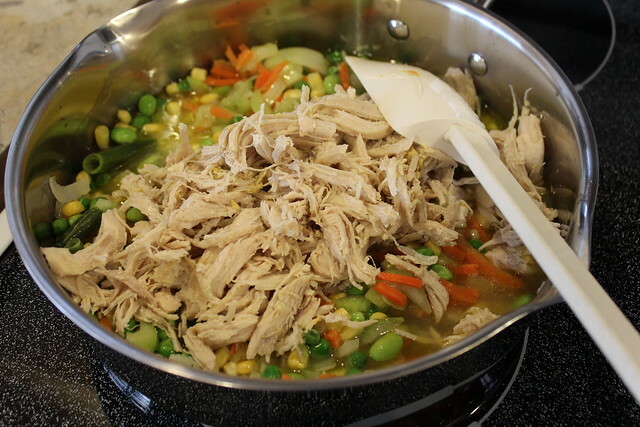 Boil Chicken in the Chicken Broth in a large pot until Chicken is done. 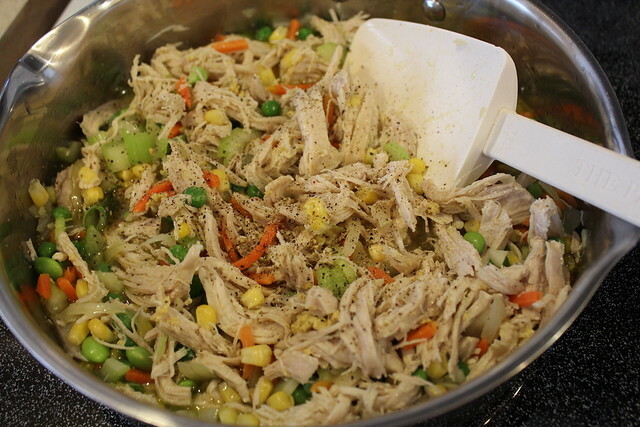 Then shred or cube Chicken into small pieces. 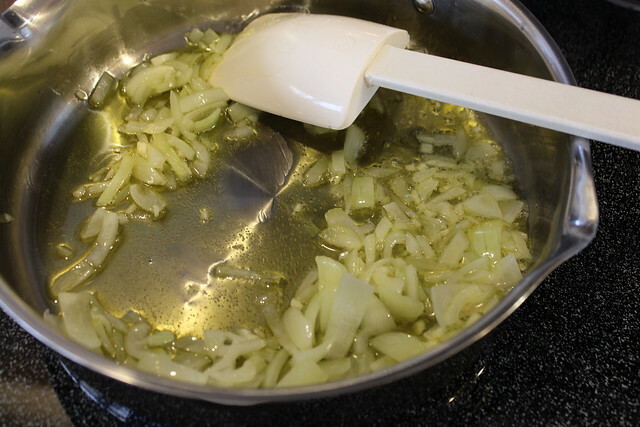 In Deep Fry Pan, Sauté Garlic & Onion in Olive Oil until soft. 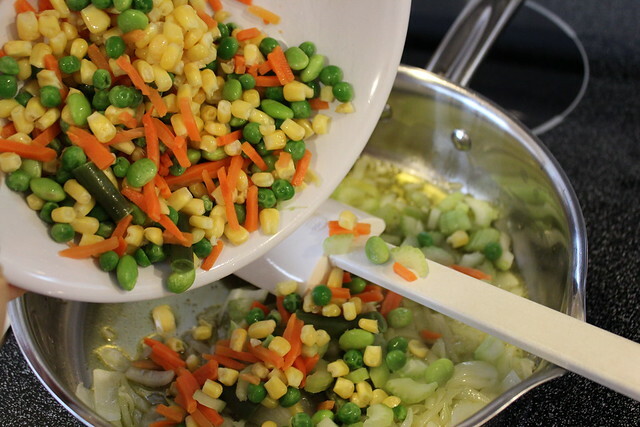 Add Celery & Fresh/Frozen Veggies to Sauté and stir until well mixed and warm. 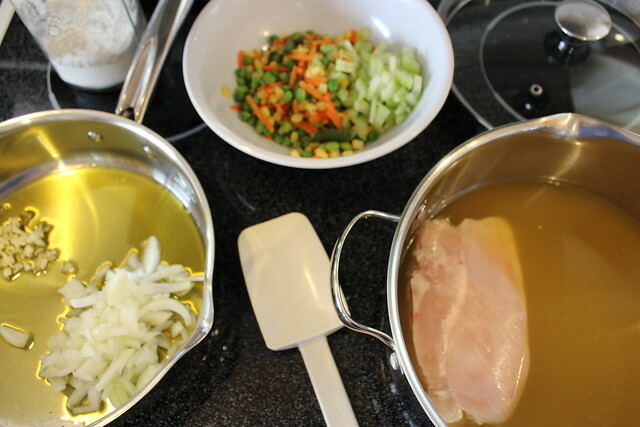 Add Sauté Ingredients to the Chicken & Remaining broth from what you boiled the Chicken in, and stir until mixture returns to boil. Add in Erika’s All Purpose Gluten Free Flour 1 Tablespoon at a time until mixture is thick. 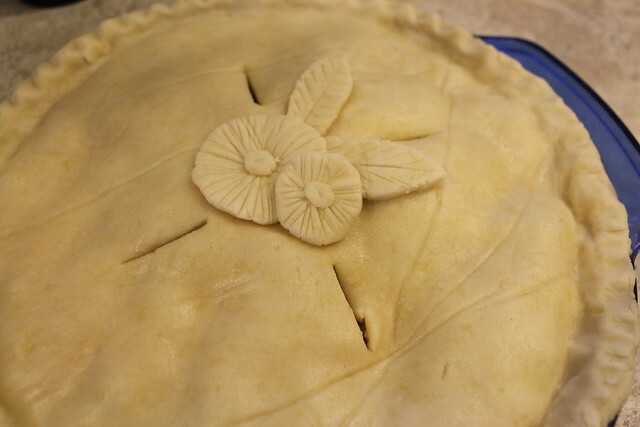 Pour into prepared Gluten Free Pie Crust Shell & Top with Gluten Free Pastry Crust. 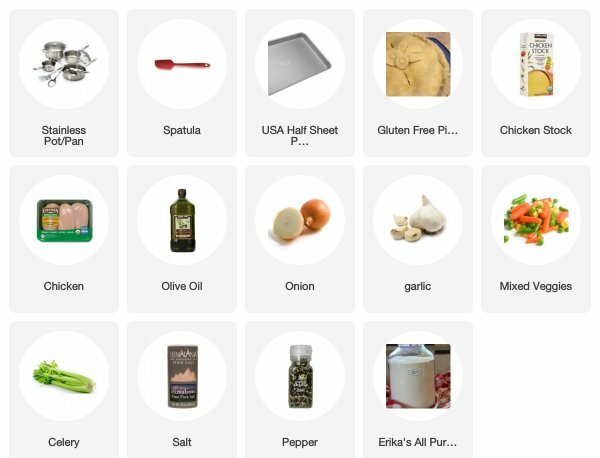 Place prepared Chicken Pot Pie on Foil Lined Baking Sheet to catch any boil-over & mess. Cut 4 small slits in top center, and bake at 425 degrees until crust is golden brown. Approximately 30-45 minutes. Cool for 10 minutes and serve. Tastes great hot or cold. Store leftovers in airtight container for up to 3 days in fridge. 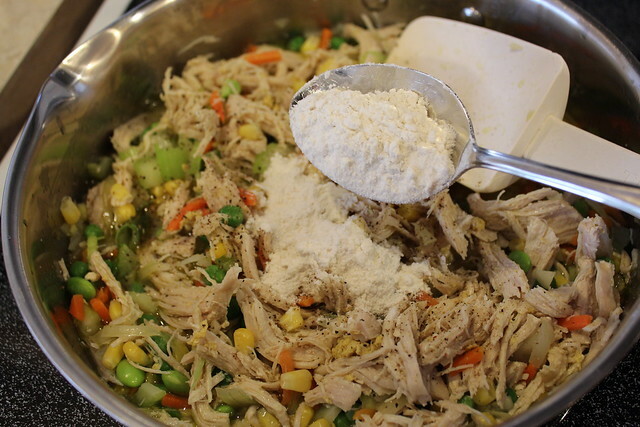 You can easily prepare this recipe in bulk – I usually make 4 at a time. I cook 1 for dinner and freeze the others without cooking them. 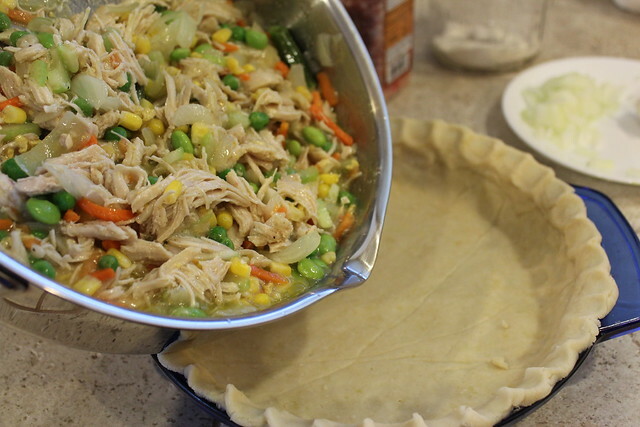 There’s no need to defrost the Pot Pie before placing it in the oven at 425 for 45 min – 1 hour. I generally test the center with my thermometer to make sure the center is thoroughly thawed and reaches at least 100 degrees. 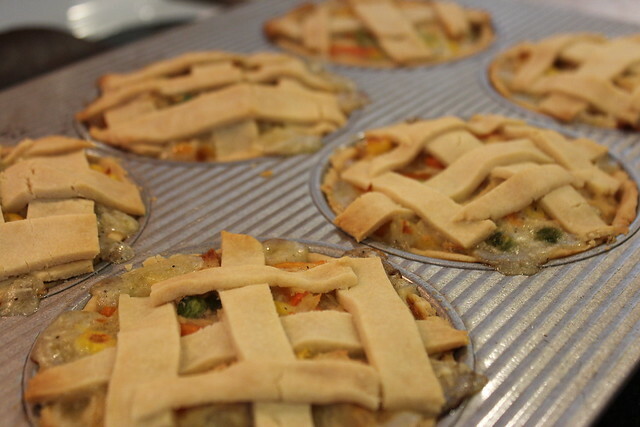 Freeze Uncooked Pot Pies & Cook them Later! Perfect for those upcoming mainland chilly fall days. Can’t wait two try! Miss you guys! To try. Curse you auto correct! This is theBest Pot pie ever. Your crust was simply AMAZING! Flakey and tasty with out the after taste, unlike any other gluten free crust I have tried in two years. My husband even loved it and he doesn’t do gluten free but if it taste this good he will Thank you for sharing this recipe. Great recipe! My entire family begged for more. Tried this and loved it! Definitely will be making it again. Where do you buy Palm Shortening? I called Whole Foods, Central Market, and Sprouts and none of them carried it. You could add a cream made of soaked cashews that you then put into the vitamin with a little water… the taste and texture is perfect and you will have that creamy taste that you love !! You could also make a more white sauce for less than the cost of cashews. 1.5 TBS olive oil, 1 TBS flour and 1 cup dairy free milk. Fry the flour and oil in pan for a few min, don’t let it stick, then slowly add the milk and heat, it will thicken once it is brought to a boil season with salt, pepper, garlic, onion, whatever. If you want to make an even cheaper sauce, add some cooked rice with water and blend in the vitamix. A quick, cheap, milk when in a pinch. It makes a really yummy base, just an FYI. Loved this and so did my 8-year old daughter! We used corn, peas, carrots, shiitake mushrooms and a potato along with the onions and garlic and added some truffle oil for fun – delectable and so flexible that you could throw any leftovers in and it would be perfect! Looks delicious! 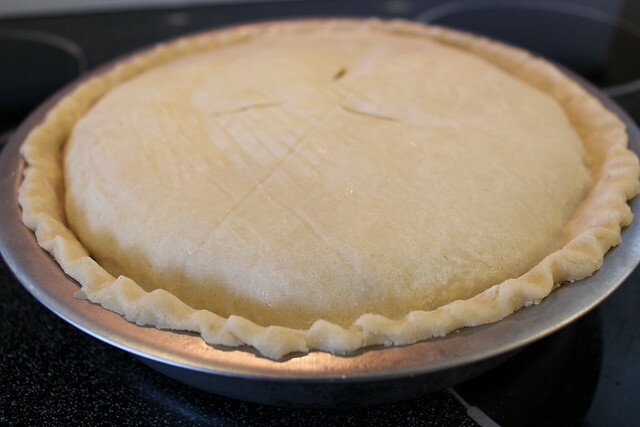 Do you think that I can use this pie crust recipe for a sugar cookie to use with a cookie cutter. My son is gluten, dairy, soy, sugar (except for honey, stevia and coconut sugars) and he desperately wants a cookie. I wouldn’t use this recipe for a Sugar Cookie base – although I love that you’re willing to try it for you sweet son! =) I have a great sugar cookie recipe that I haven’t posted yet – but I’m thinking you might be able to modify the Gluten Free Toll House Cookie Recipe I posted and sub the brown sugar for Maple Syrup & the white sugar for Coconut Sugar. If the mixture is too sticky, you can add in a small amount (1/4 cup) of Apple Sauce. If it’s too wet, try adding a bit of Coconut Flour (if you have it on hand)… leaving out the chocolate chips of course. I’d love to make this. I already have cooked chicken breast, leftover from another meal. 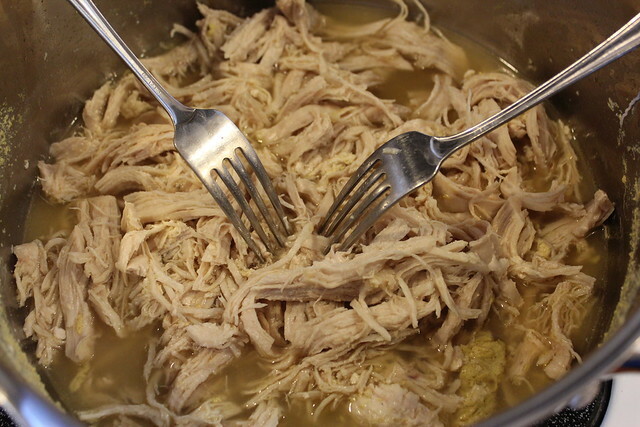 Do you know approximately how much broth you used after the chicken was cooked? I want to add the broth in but don’t want to add to much and have it be soggy. Thanks!!! Made this tonight and it was delicious! I admit I used part oil and some butter to sautee the veggies in, but the whole family loved it. My 6 year old gave it two thumbs up! Anyone who hasn’t tried this yet, get busy!! OMG!!! Not only beautiful, but dee-licious. Built it in a small springform pan. After it cooled about 15 minutes, I removed the sides and Wowee! It stood there as proud as could be. Crust retained it’s integrity both overnight and out of the freezer heated up. Made this over the weekend for some GF friends. Was absolutely DELISH! Though I ended up with enough filling for 2 pies – I did use 2 rather large chicken breasts, but everything else was according to the recipe. Since everyone loved it, just whipped together another pie crust and plopped it in the deep freeze for some other time. The crust was a bit of a challenge to find the right consistency – but we got there eventually – a little extra flour, a little more water. Oops – a little more flour. You just have to play around with it until you can roll it out without it getting stuck to the wax paper, or falling apart when you try to take the wax paper off. A definite keeper for the GF & non-GF alike! Delicious! I had to used flax seeds and hot water as a binder, (I ran out of eggs) and I was worried about the crust, but aside from being a little crunchy, it was good. But the pie filling was wonderful. Okay, I’ll admit it, I am the person who LOVES the 79 cent chicken pot pies–the ones where you have no idea what is in them? But this was ssoooo much better. Thanks for the recipe. I have used your pie crust recipe (with the egg) before and it was good, too. Hi, thank you for this recipe! I made it, with some slight modifications, for a potluck and it was a hit. I feel like I’ve been searching for a blog like yours for a long time. Made your crust into an apple tart last night for my g free friend and now i’m going to make this pot pie. Thanks for making non-complicated and delicious recipes!! !